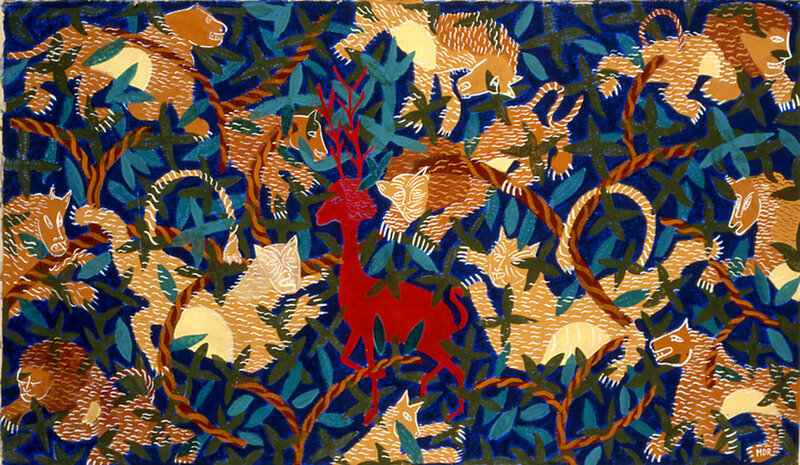 Mémoire de l'âge d'or II, Tempera on Nepalese Paper, 2002, 58 x 9 9 in. Marco Del Re is an Italian painter, engraver, lithographer, illustrator and draughtsman. His work is a voyage through diverse eras, where classical tradition and Modern Art merge. His universe is an homage to Art History, Mythology, and Literature embellished by his own memory, thus giving him his originality. This freedom is visible in his lithographs, his engravings, his paintings, and in other domains. Maeght Editeur published several literary works illustrated by Del Re, including The Rough Field anthology by the Irish poet John Montague. Although he continues tradition while working in the engraving workshoping in Saint Paul, in his own Parisian workshop he experiments with new techniques to imbue his creations with freedom. Del Re was trained in architecture before living in Rome and Venice. He moved to Paris in 1989. He enjoys working with proficient artisans to create new forms of expression that combine tradition and modernity: Nepalese paper, Ottoman kilims, tapestries for the Mobilier National, Limoge porcelain and of course the interior decoration of the Salle Pleyel. Since 1974, he has participated in collective exhibitions at the Palais des Beaux-Arts, Brussels, the Tenth Biennale in Paris and the Pully Museum in Switzerland. He also held several solo exhibitions in Turin, Geneva and Paris.